This photo shows a beautiful evening of Toronto Skyline seen from Centre Island, Toronto Islands, Lake Ontario, Ontario, Canada. A beautiful evening of the Toronto City skyline reflects on Lake Ontario reveals long colourful reflecting streaks on the lake’s calm blue waters. Toronto city’s eclectic architecture adds to the attractive skyline with the glowing Rogers Centre also known as the Skydome. 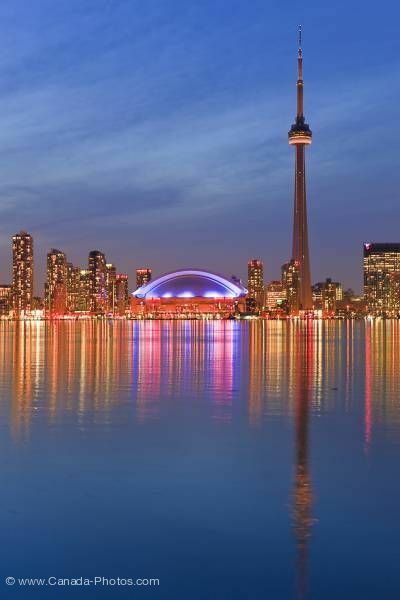 The CN Tower stands tall over the city of Toronto.